Title:Tiomnadh Nuadh ar Tighearn Agus ar Slanuighir Iosa Criosd, Air a Tharruing o 'n ghreugais Chum Caelic Albannaich; agus Air a Chur a Mach le H-ughdarras Ard-Shean-Aidh Eaglais na H-alba. Edinburgh Bible Society. Edinburgh: Printed by Anderson and Bryce: For the Edinburgh Bible Society; by permission, from the Quarto Edition of the Society in Scotland for the Propagating Christian Knowledge. 1839. Publisher: Edinburgh: Edinburgh Bible Society. 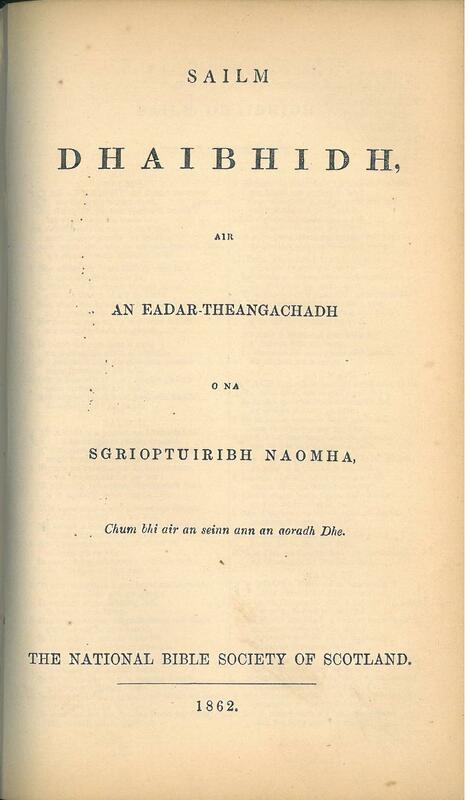 Title: Sailm Dhaibhidh air An Eadar-Theangachadh o na Sgrioptuiribh Naomha. The National Bible Society of Scotland. 1862. Comments: This was bound with the New Testament above. 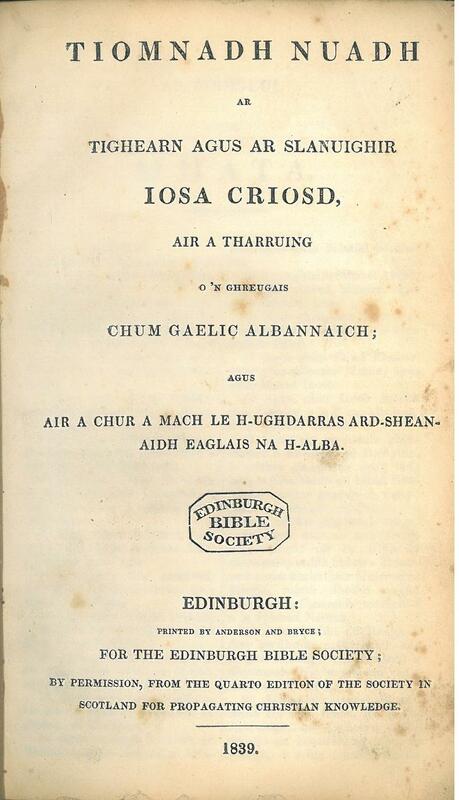 Title:Tiomnadh Nuadh /ar / Tighearna Agus ar Slanair, / Iosa Criosta, / Air a Thionndadh as an Laidnin / Gu Gaidhlig. / Le Aonta Easbnigean as h-Alba. / Aberdeen: A. King & Co., Printers and Stereotypers. 1875. 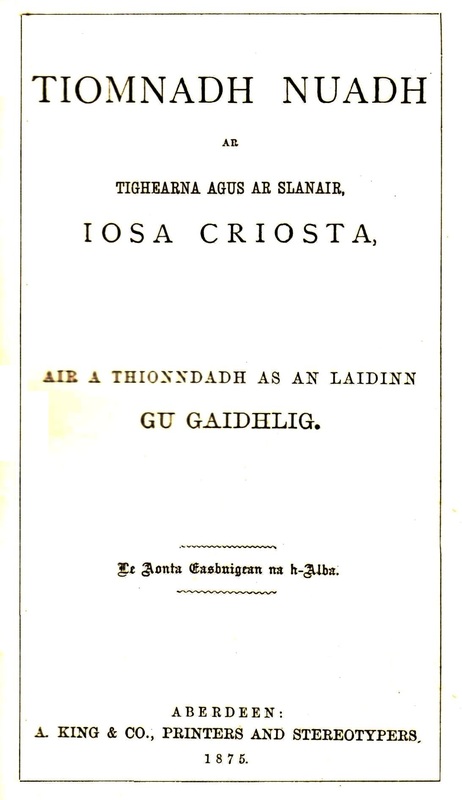 Comments A Catholic translation from the Latin Vulgate by Father Evan MacEachen and edited from his manuscript by Father Colin Grant with the assistance of other priests. The idiom differs from that in the Protestant versions by being more strongly Scottish Gaelic; while the orthography mainly the pronunciation of Lochaber.